Sometimes is hard or too expensive to find the right curtains for your kitchen windows. Why not just make them? Beautiful curtains work like magic. They can make any room look fabulous instantly even with little or no furniture at all. Find the perfect free crochet curtain pattern for your kitchen in this selection of 8 most beautiful and easy to make crochet curtains for your kitchen windows. Here is a selection of 8 fabulous and free curtains patterns that you can use to beautify your kitchen. 1. 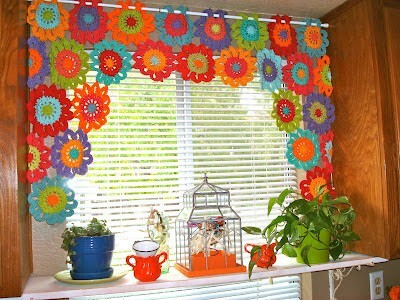 Flower Power Valance by Robin of Once Upon A Pink Moon. Gorgeous pattern that uses half flowers and full flowers for this curtain. There’s a beautiful photo tutorial to help you with the curtain making and also a couple of video tutorials. For more curtain patterns, please go to the next page. Your next day off, we need to do this. I love #1 #2 & #8!!! Made this for my daughter..too cute!! I’ve made a couple of these and they’re awesome. A 4foot and 2 foot wide one. Enjoyed it heaps. Diane Briggs, the adverts are related to your previous searches on the device you use. Not everyone gets that advert. However, the patterns are all available and linked to the names of the patterns as always. Hope it helps! They can make any room look fabulous instantly even with little or no furniture at all. Find the perfect free crochet curtain pattern for your kitchen in this selection of 8 most beautiful and easy to make crochet curtains for your kitchen windows. You could make shower curtains too.